Was Alexander Hamilton sent ahead to notify Benedict Arnold of Washington’s arrival just before Arnold’s treasonous flight? On September 25, 1780, on their return from Hartford, where they had a conference with French commander-in-chief Jean-Baptiste Donatien de Vimeur de Rochambeau, “Washington, the Marquis de Lafayette, General Knox, and their aids” decided to inspect the fortifications at West Point. Nearing their destination, word of their imminent arrival was sent to Benedict Arnold’s headquarters at the house of Beverly Robinson on the east side of the Hudson River just across from West Point. But before visiting Arnold, Washington first wanted to inspect “the North and Middle Redoubts,” also on the east side of the Hudson. Not one contemporary eyewitness account has been found stating that Hamilton had been sent ahead to notify Benedict Arnold of Washington’s arrival. On September 25, 1780, the same day these events took place, Lafayette wrote, “We were preceded by one of my aides-de-camp and one of General Knox’s.” As Hamilton was an aide to neither Lafayette nor Knox, he could not have been one of the two aides sent ahead, according to this first-hand account written at the time. An anonymous letter dated September 26 and published in The Pennsylvania Packet just a week later reported, “His Excellency General Washington, the Marquis de Lafayette, General Knox, and their aids were within a few miles of [Arnold’s] quarters at this juncture. I had preceded them with a Major Shaw, to give notice of their coming.” This letter could not have been written by Hamilton because the author later wrote about “Col. Hamilton and myself.” Thus, two contemporary eyewitness accounts rule out Hamilton as one of the two aides sent to notify Arnold of the group’s later arrival. Another contemporary account, by one who was not there but who was in the army just thirty miles away and recorded these details shortly after the events took place, confirms these two accounts and identifies the anonymous author of the report published in The Pennsylvania Packet. Dr. James Thacher wrote that it was “Major Shaw and Dr. McHenry, two of his Excellency’s aids,” who were sent ahead to Arnold’s headquarters. Accordingly, James McHenry was the author of the anonymous letter published in The Pennsylvania Packet. Thacher, however, was mistaken about these two men being Washington’s aides. McHenry was an aide to Lafayette at this time and Shaw was an aide to Knox, which agrees with Lafayette’s statement. * James Fenimore Cooper, Notions of the Americans 1:282 and 282n; John C. Hamilton, The Life of Alexander Hamilton 1:262; Leake, Memoir of the Life and Times of General John Lamb 260; Washington Irving, Life of George Washington 4:130; John C. Hamilton, History of the Republic 2:54; George Canning Hill, Benedict Arnold: A Biography 249; Riethmüller,Alexander Hamilton and his Contemporaries 81; Isaac Newton Arnold, The Life of Benedict Arnold 295; Fiske, The American Revolution 2:225; Atherton, The Conqueror 204–205; Todd, The Real Benedict Arnold 204; Frank Landon Humphreys, Life and Times of David Humphreys 1:178; Loth, Alexander Hamilton: Portrait of a Prodigy 94; Van Doren, Secret History of the American Revolution 345; Schachner, Alexander Hamilton115–116; Randall, Alexander Hamilton: A Life 205–206; Chernow,Alexander Hamilton 140. ** Freeman, George Washington: A Biography 5:196; Flexner, The Traitor and the Spy 366; Mitchell, Alexander Hamilton: Youth to Maturity 211; Flexner, George Washington in the American Revolution 384; Mitchell,Alexander Hamilton: The Revolutionary Years 200; Hendrickson,Hamilton 1:274; Flexner, The Young Hamilton 307; Lefkowitz, George Washington’s Indispensable Men 209. Alexander Hamilton: The Formative Years also details the origins of the idea that Hamilton had been sent ahead to tell Arnold of Washington’s approach. 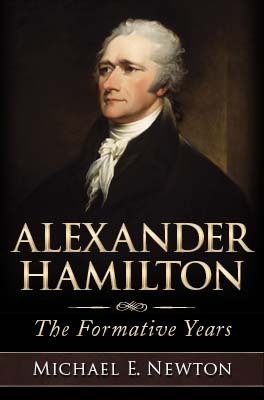 Supporting evidence and citations will be found in the endnotes of Alexander Hamilton: The Formative Years.